Commute Challenge ’18 — Bicycle shop voucher prizes! How much can you ride during Bike Week? Ride. Log your trips. Be in the riding to win hundreds of dollars of bicycle shop vouchers! The Commute Challenge is a friendly competition to encourage cycling as a fun and healthy alternative to vehicle commuting. Participants can register as an individual or team of 3-8 riders. Participation is easy, all you have to do is log your bike commutes online. Encourage riders at your school or work to participate! Challenge other schools and businesses to see who can ride the most! To register a team, have one person from the team create a team name. Other team members can then select that team name when recording their commutes in the online trip table. What can I count as a commute/trip? Any bicycle ride you take between the competition start and end dates that takes you from point A to point B for a specific purpose. For instance, commutes from home to work, to do the shopping, to visit a friend or run an errand, or any other non-recreational ride that may have otherwise been done in a vehicle. 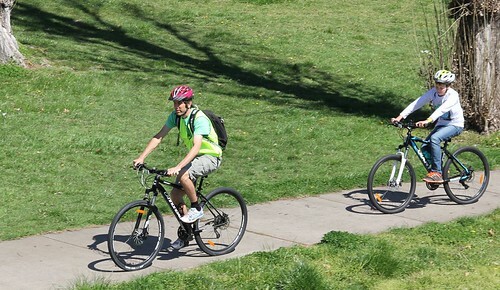 The purpose of this competition is to get people pedalling instead of driving and to promote bicycling as a sustainable transportation mode in Armidale. While we encourage you to rack up the kilometres by biking as many places as you can during Bike Week, points will also be awarded for number of trips taken by bike! How do I submit my commute/trips? Data must be submitted within 2 days of the end of the competition. How do I know how many kilometres I’ve ridden each day? « Family Fun Creek Ride!